Icecream Screen Recorder is an ultimate tool for capturing any on-screen activity like streaming video, webcam, games, etc. 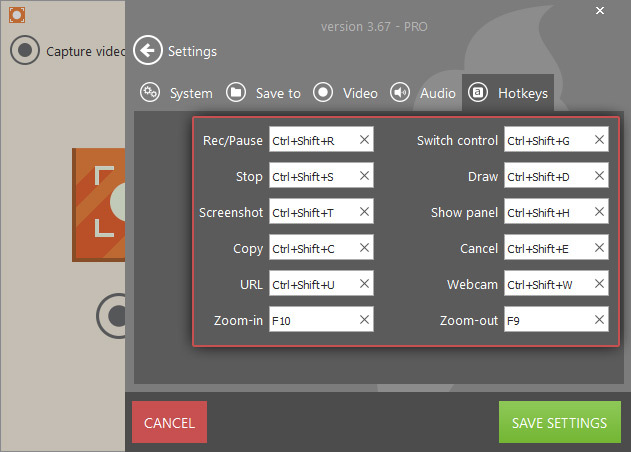 The program offers a bunch of recording settings to give the users total control over the output video files. 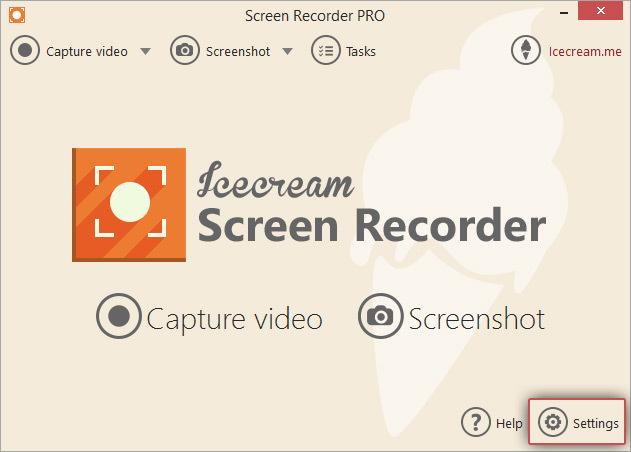 Read on to get full information about how to change recording settings in Icecream Screen Recorder and capture screen in the best way possible. Language. Select the language of the UI of the program here. Press the cursor within the white area next the “Language” option to select the required language from the drop-down list. The software supports over 45 languages. Show notifications. If this option is enabled, the software will show you the pop-up notification windows in the lower right hand corner of the screen. You might want to disable it not to receive any notifications of this screen capture software. Area selection zoomer. This tool is extremely handy for the most accurate selection of the frames and position of the recording area. It zooms the area where the mouse cursor is currently located. Hover the mouse over the borders of the recording area to check if they are placed properly. Webcam. 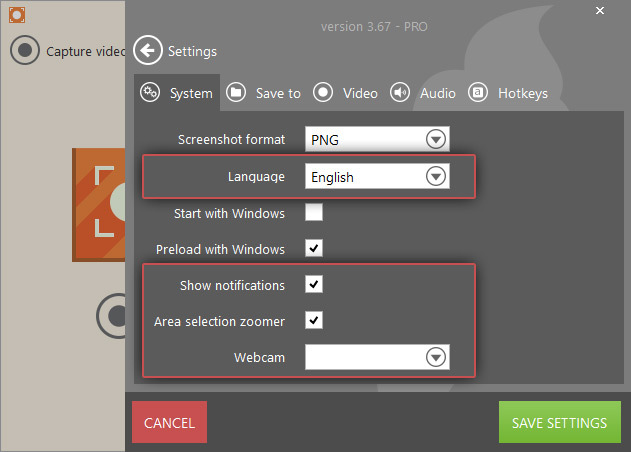 Icecream Screen Recorder supports the addition of the webcam window within the selected recording area. To select the right webcamera device to record from click within the white area to the right of “Webcam” option to select the right webcamera. NOTE: Make sure to press "SAVE SETTINGS" button to apply the changes. Save video to. Click the folder icon to the right of the “Save video to” setting to open Windows Explorer and select the folder on your PC to which the videos will be saved. Max file size. 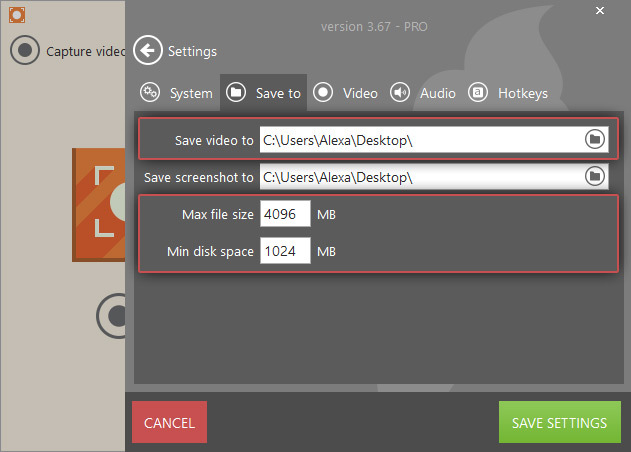 As soon as the recorded video size reached this limit, the program will stop video recording automatically. The default value set for this option is 4096 MB. You may customize it according to your own preferences. Min disk space. The value set for this option defies the amount of the free disk space of the disk where the folder stated in “Save video to” setting located. The default value set here is 1024 MB. You may customize it according to your own preferences. Video format. 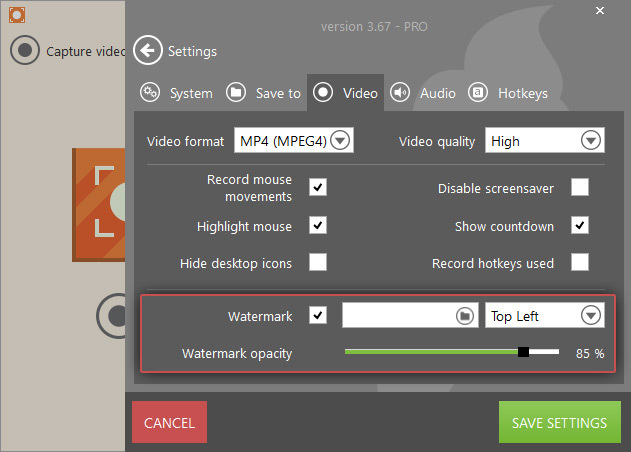 To select the output video format of the video click the arrow to the right of this setting to open the drop-down list with all the output video formats supported by this screen recorder. There are such formats to choose from as MP4 (MPEG4), MP4 (H264), AVI (MPEG4), AVI (H264) and WebM (VP8). Video quality. There are 3 different video quality levels you can select from: High, Medium and Low. Record mouse movements. Enable this feature to show the mouse cursor movements in your output video. In case this feature is disabled, the mouse cursor won't appear in the resulting video at all. Highlight mouse. If this option is on, each mouse click will be highlighted with a yellow circle around the cursor. In case you wish to remove it – turn this feature off. Hide desktop icons. In case this setting is ticked, the desktop icon will be hidden in the video recorded with the program. If it's unticked, all your icons located on the desktop will appear in the video as is. Disable screensaver. This feature might me handy for those, who are planning to record long videos as if it's enabled it blocks the appearance of the screensaver on your PC. In case this option is disabled, your default screensaver will show up according to its settings. Show countdown. This option enables or disables the 3-2-1 countdown that is being shown primarily to the video recording. Record hotkeys used. During the screen capture process some users tend to use various hotkeys combinations that include Ctrl and Ctrl+Shift. When this option is on, these hotkey combinations will be shown in the output videos in the lower right corner exactly at the time when they were used by the user. Watermark. User can upload their own images to be added to the captured videos as custom watermark. Click the folder icon to the right of the “Watermark” option to open Windows explorer and browser for the image to be uploaded and used as a watermark. Icecream Screen Recorder supports JPEG, JPG, PNG and BMP images. The max image size is 300x300 pixels, the min image size is 30x30 pixels. Watermark location. As soon as an image to be used as a custom watermark is uploaded, you can select it location in the output video. There are 5 options to select from: Top Left, Top Right, Bottom Left, Bottom Right and Center. Chose the one that suits your needs. Watermark opacity. Toggle the scrollbar to the right of the “Watermark opacity” sign to defy the level of its transparency. Record audio. If you wish to record the audio along with your video – put a tick next to this option. The audio level can be adjusted by means of the scrollbar to the right of the “Record audio” option. To the right of the scrollbar there's an equalizer. If you see it's moving while there's some audio is currently present or playing on your computer, it means the audio device is selected properly. Record microphone. 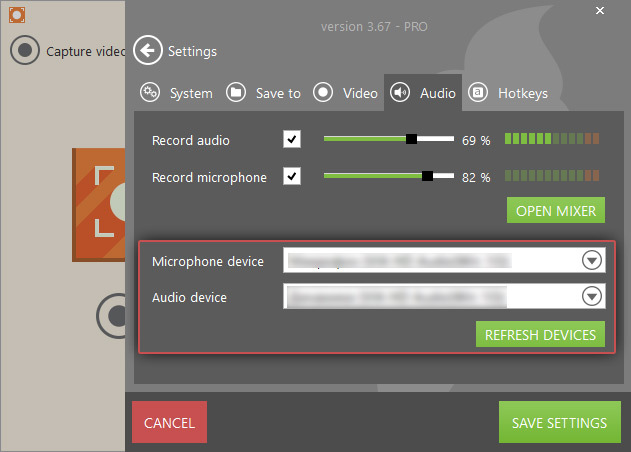 To include the mic recording to your video tick this option. Adjust the mic audio level with the help of the scrollbar to the right of this setting. If the equalizer to the right of the scrollbar is moving while you speak, you have selected the right microphone device. OPEN MIXER. This button opens the default Windows Volume Mixer panel where you can customize the volumes of the applications and the devices of your computer. Microphone device. Click the arrow button to the right of this setting to open the drop-down list with all the mic devices that are currently available on your PC. Audio device. Click within the white area next to this option to see the list of all the audio devices that are currently available on your computer. REFRESH DEVICES. After hitting this button the program refreshes all the audio and mic devices that are connected to your PC. Thus, if you plug in a new audio or mic device and the program doesn't recognize it, press this button so the new device would be added to the list of available ones. Hotkeys like “Rec/Pause”, “Stop”, “Zoom-in”, “Switch control”, “Draw”, “Show panel”, “Cancel”, “Webcam” and “Zoom-out” will help you record videos in a more convenient way. The program offers default hotkeys combinations, but you can change them to the custom ones if necessary. Simply type in the desired combinations in the corresponding fields and save the changes.